I have a new tool. Shrewsbury has a QVC shop that sells returns and left-overs from a shopping channel. It’s the sort of place which is about 90% tat, but the occasional gem lurks among the polyester clothing and strange household gadgets. Yesterday I acquired a wearable magnifier, which I rather expected to be a waste of money. 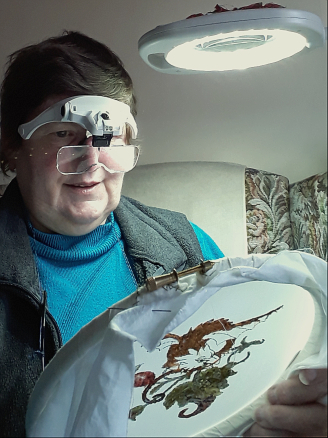 I have tried-on headbands and spectacle-type magnifiers before, and found them too heavy, too uncomfortable or simply not angled right for embroidery. (I dislike round-the-neck and magnifying lamps because they make me sit too still in order to see the work.) This one was reduced to £4.99, so would probably prove another purchasing mistake….